In this tutorial we will setup a basic LDAP structure containing users and roles. We will be using the excellent Apache Directory Studio IDE. This tutorial will be the basis for our other Spring LDAP integration tutorials. What is Apache Directory Studio? 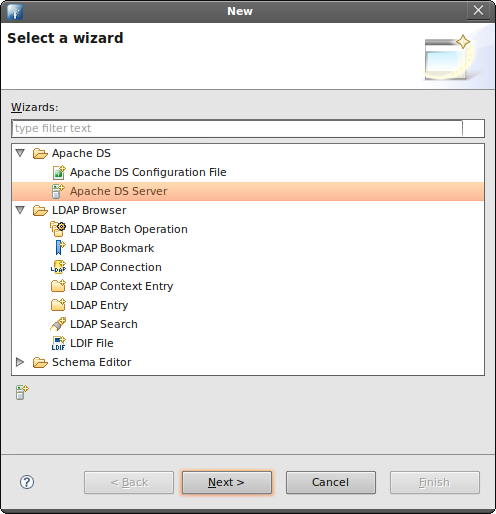 The Lightweight Directory Access Protocol (LDAP) is an application protocol for reading and editing directories over an IP network. A directory is an organized set of records. For example, the telephone directory is an alphabetical list of persons and organizations, with each record having an address and phone number. A directory information tree often follows political, geographic, or organizational boundaries. LDAP directories often use Domain Name System (DNS) names for the highest levels. Deeper inside the directory might appear entries for people, departments, teams, printers, and documents. If this is your first time to LDAP, you might be wondering how is this different from an RDBMS. I suggest my readers to visit the following article Should I Use a Directory, a Database, or Both? We have a small startup company named Mojo Enterprises. We have four people, and two of them are admins. Our task is to create a hierarchical structure of our organization using LDAP because we anticipate the eventual growth of the company. We may have hundreds of people from different departments in five years time. Each has their own information and structure. These information and structure will be shared among different applications of the company. LDAP is a good protocol to meet all these requirements. Let’s define the important elements of the company. LDAP is a hierarchical tree structure, so our design will be influenced by that. We need to assign the topmost parent of our structure. Logically, the name of the company fits that requirement. We’ll pick the name mojo as the topmost parent. Under the mojo we will assign our members. There are many ways to organize our members. We can organize them by gender, by job function, and etc. For this tutorial we’ll organize them based on identity and roles. We’ll put all the identities of each person in a separate element, while the roles will be placed on another element. Under the roles we have two sub-divisions. Remember we have the regular users and the admins. What we’ll do is divide the roles into elements. It’s really simple to do. All you need is an Apache Directory Studio, this tutorial, and patience. Before we can do any LDAP-related work, we need to have an IDE first. Although it’s not required, we’ll require it for this tutorial. And why not? It’s free anyway. 1. Open Apache Directory Studio. 3. Go to File, and click New. A popup window will open. 8. A new server has been added on your Servers panel. 9. Select your server, then click the Run button. 1. Right-click on your server. 3. Select Create a Connection. An alert message will popup indicating the a new connection has been created. 4. Go to the Connections panel. 5. Double-click the name of the new connection you’ve created earlier. 6. The LDAP Browser panel should refresh and show the contents of the server. Notice the topmost entry of this server is DIT, followed by the Root DSE. 7. Expand the Root DSE folder. 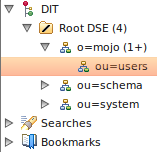 There are two sub-entries: ou=schema and ou=system. These are partitions in the server. Do not modify them unless you know what you’re doing. 1. Go to the Servers panel, and right-click your server. 2. Select Open Configuration. A server.xml editor will appear on the main panel. 3. At the bottom part of server.xml, there are five tabs. Click the Partitions tab. The Partitions tab should appear. 4. Click on Add and enter the following details for this new partition. 5. Save your changes (CTRL + S). A new partition has been added. 6. 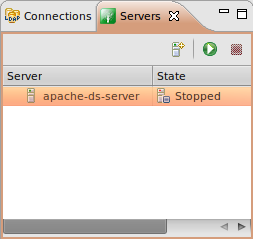 Restart your Apache DS server. 7. 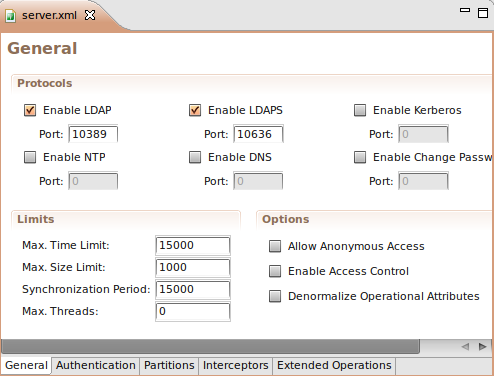 Refresh the LDAP Browser panel. 8. Click on the Root DSE folder. A new editor will open containing the details of this folder. Notice the namingContexts attribute. 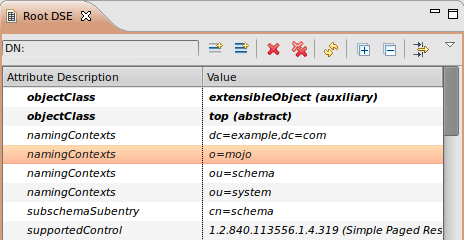 The namingContexts o=mojo shows in the lists. 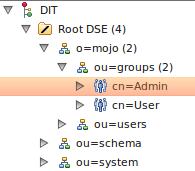 However it doesn’t show under the Root DSE tree because we need to add the organization manually in the tree. Our company is an organization. In LDAP, to represent a company we use the organization object which is represented by the alias o. So if our company’s name is mojo, the Distinguished Name (dn) of the company is o=mojo. It’s a naming convention. (The Distinguished Name is like the primary key or primary identity). 2. Select Create entry from scratch. Click Next. 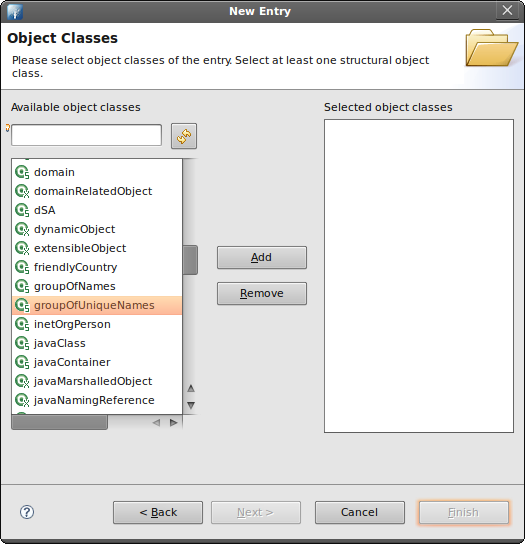 The Object classes window will appear. 4. Click Next. Now you need to enter a Distinguished Name (dn). Click on the pulldown menu. Select o=mojo. 5. Click Next. 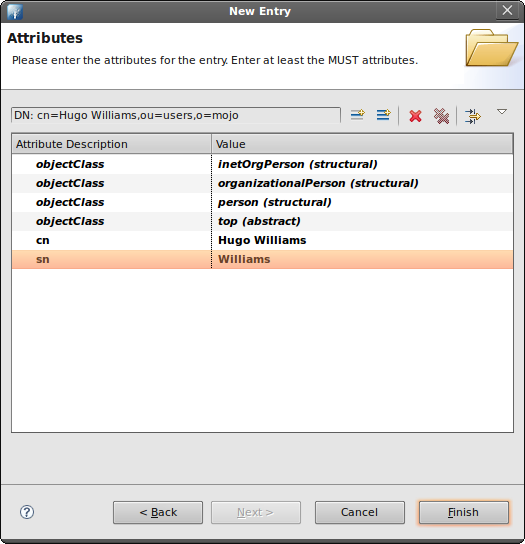 The Attributes window will appear. Examine the values. 6. Click Finish. Notice the new partition now appears under the Root DSE. Earlier we mentioned we’ll structure our company based on users (contains personal information of the user) and groups (contains the authorization level of each person). Both of these represent an organizational unit. 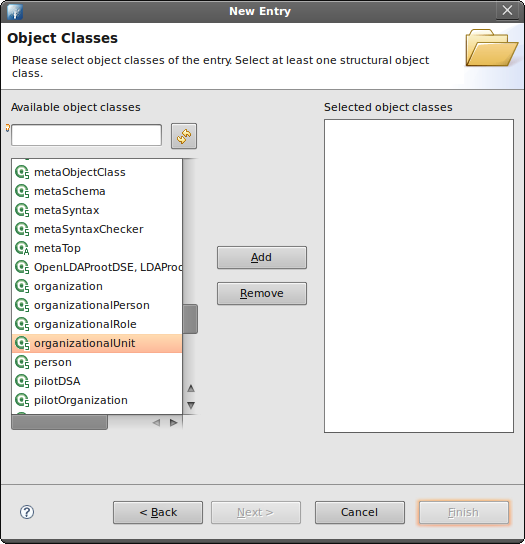 In LDAP, to represent an organizational unit we use the organizationalUnit object which is represented by the alias ou. 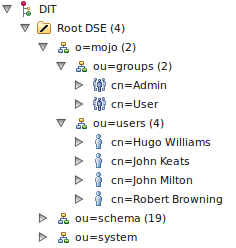 So if we have a unit name users, the Distinguished Name (dn) is ou=users,o=mojo. Why is there an o=mojo? It’s a naming convention. The same convention applies to groups. 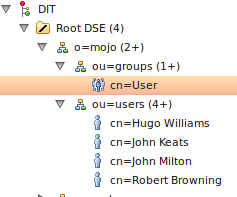 The Distinguished Name (dn) is ou=users,o=mojo. This can be likened the way we name URLS. For example, users.mojo.com or groups.mojo.com. 1. Go to the LDAP Browser panel. Expand the Root DSE folder. 2. Right-click the o=mojo entry. Select New. Select New Entry. 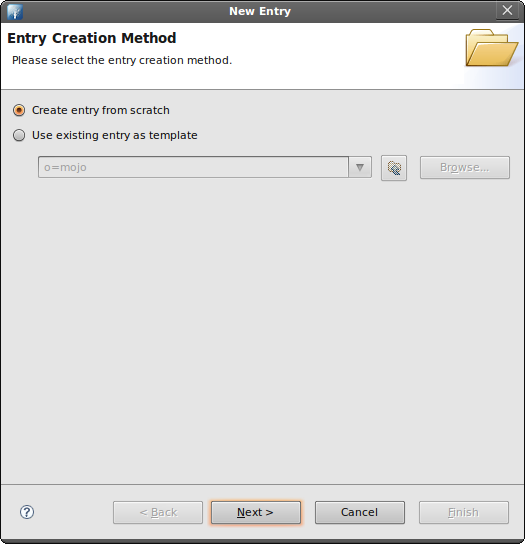 The Entry Creation Method window will appear. 3. Select Create entry from scratch. Click Next. 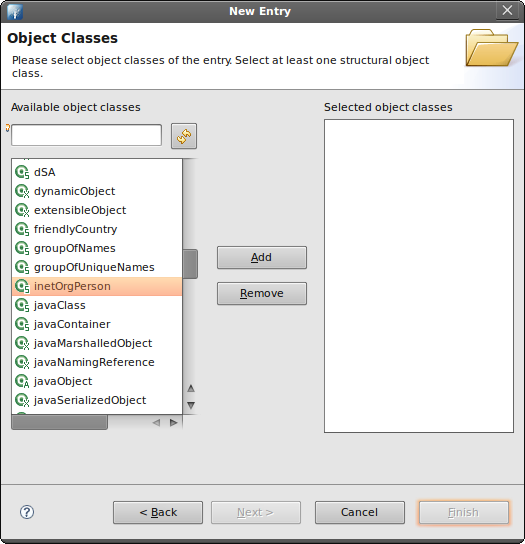 The Object Classes window will appear. 4. Find the organizationalUnit object. Select it then click Add. 5. Click Next. Now you need to enter a Distinguished Name (dn). The Parent field should read o=mojo. 6. Click Next. The Attributes window will appear. Examine the values. 7. Click Finish. We’ve just created the ou=users organizational unit. 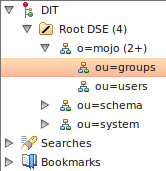 We’ve just added the ou=users organizational unit. We need to add the organizational unit for groups as well. We’ll follow the same steps. 7. Click Finish. We’ve just created the ou=groups organizational unit. We’ll place their personal information under the ou=users; whereas we’ll place their authorization levels under the ou=groups. Let’s start with the ou=users. We’ll be adding four persons. We’ll represent each person using the inetOrgPerson object. An inetOrgPerson can contain a user id (uid) and password (userPassword) which will be useful later for authenticating users from using LDAP. 2. Expand the o=mojo entry. 3. Right-click the ou=users entry. Select New. Select New Entry. 4. Select Create entry from scratch. Click Next. 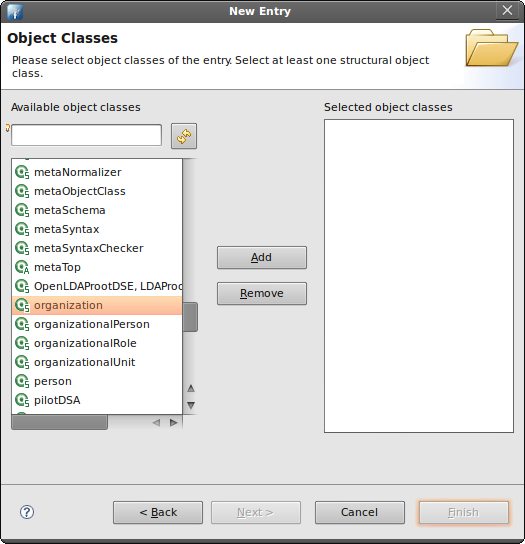 The Object Classes window will appear. 5. Find inetOrgPerson object. Select it then click Add. 6. Click Next. Now you need to enter a Distinguished Name (dn). The Parent field should read ou=users,o=mojo. On the RDN field enter cn. On the value field enter Hugo Williams. 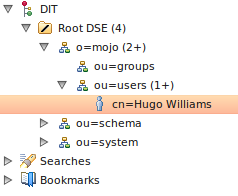 The DN Preview should read cn=Hugo Williams,ou=users,o=mojo (cn represent Common Name). 7. Click Next. The Attributes window will appear. Examine the values. 9. We need to add a username for this user. Right-click on the same window. Select New Attribute. The Attribute Type window will appear. 10. On the Attribute type field, enter uid. This will serve as the username of the person. 11. Click Next, then click Finish. 13. We need to add a password for this user. Right-click on the same window. Select New Attribute. The Attribute Type window will appear. 14. 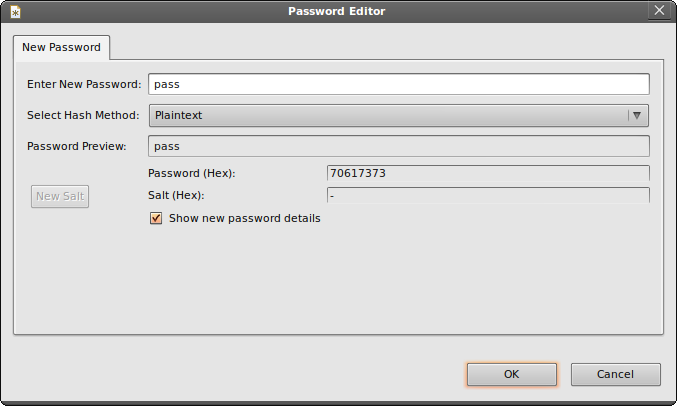 On the Attribute type field, enter userPassword. This will serve as the password of the person. 15. Click Next, then click Finish. A new entry has been added under the ou=users. The new entry is cn=Hugo Williams. Now we need to add the remaining three users. In order to do that, just repeat the same steps earlier. Here are the details of the three remaining users. 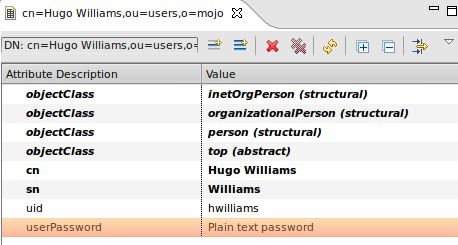 We have added the personal information, as well as the usernames and passwords, for each person under the ou=users. Now, we will be adding the authorization level for each of these persons. We’ll add them under ou=groups. We’ll use the groupOfUniqueNames object to represent each role. Let’s add the User role first. 3. 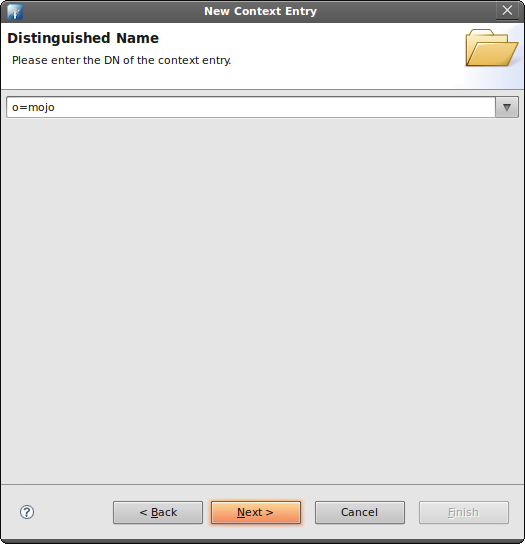 Right-click the ou=groups entry. Select New. Select New Entry. 5. Find the groupOfUniqueNames object. Select it then click Add. The Parent field should read ou=groups,o=mojo. 8. Click Next. The Attributes window will appear. Examine the values. Notice there’s a uniqueMember attribute. We’ll be placing the Distinguished Name (dn) of our users in this entry. One uniqueMember attribute will represents one user. This means we need to add three more uniqueMember attributes for a total of four uniqueMember attributes. 9. Right-click on the same window. Select New Attribute. The Attribute Type window will appear. 10. On the Attribute type field, enter uniqueMember. 12. We’re back on the Attributes window. We need to add two more uniqueMembers (for a total of four uniqueMembers). Repeat the same steps for adding an attribute. 13. Now we need to fill-in the values for these attributes. In each entry add the dn of each user. Here are the Distinguished Name for each user. 14. Click Finish when you’re done. Now we need another entry for the Admin role. We’ll repeat the same steps. Notice there’s a uniqueMember attribute. We’ll be placing the Distinguished Name (dn) of our users in this entry. 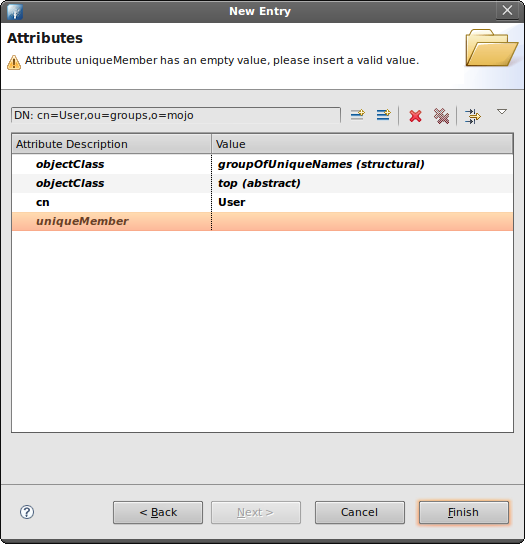 One uniqueMember attribute will represent one user. This means we need to add one more uniqueMember attributes for a total of two uniqueMember attributes. 8. Right-click on the same window. Select New Attribute. 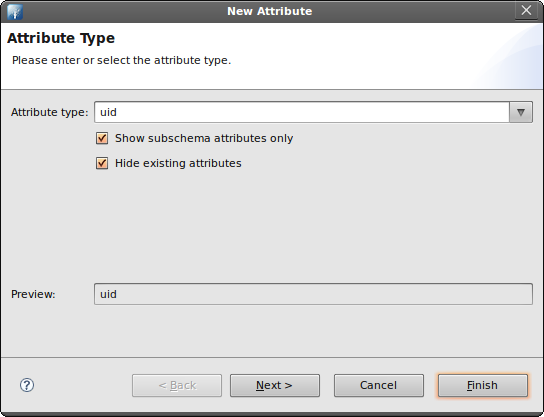 The Attribute Type window will appear. 9. On the Attribute type field, enter uniqueMember. 10. Click Next, then click Finish. 11. We’re back on the Attributes window. We need to add one more uniqueMembers (for a total of two uniqueMembers). Repeat the same steps for adding an attribute. 12. Now we need to fill-in the values for these attributes. 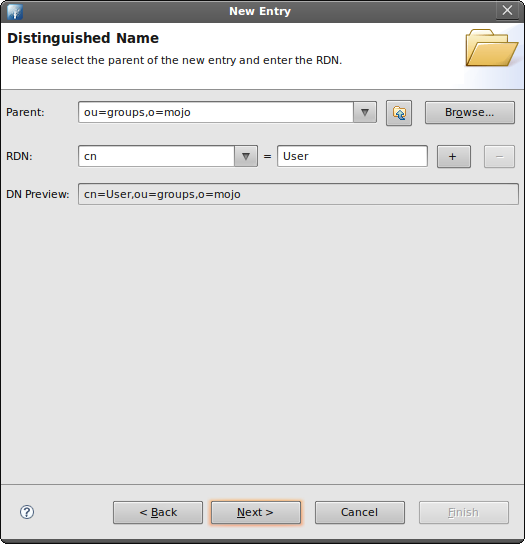 In each entry add the dn of each user. Here are the Distinguished Name for each user. 13. Click Finish when you’re done. That’s it. 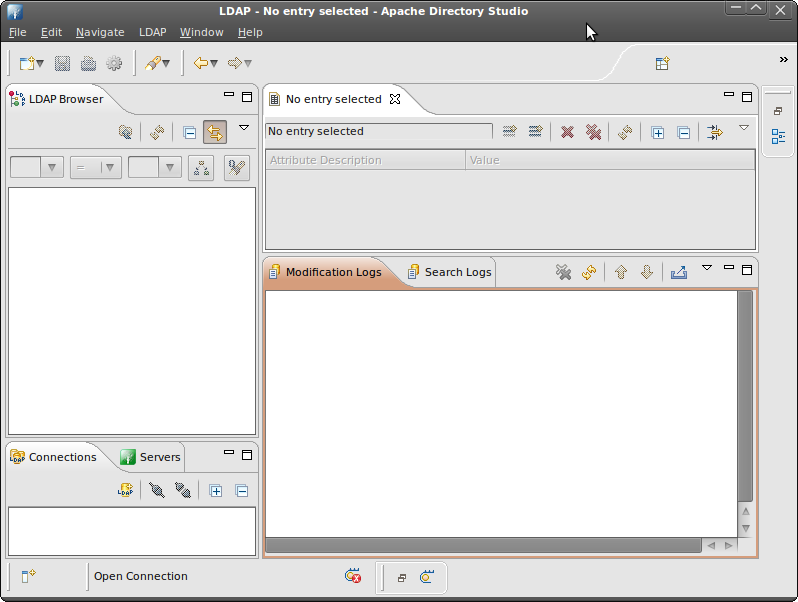 We’ve managed to setup our basic LDAP structure using Apache Directory Studio. We’ve also covered some of the popular LDAP objects. This entry was posted in Linux and tagged Apache DS on 2017-09-04 by coder4.